I just had a great group of friends over to dapple in the art of apple printing today. 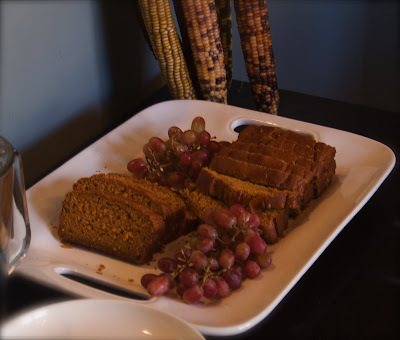 I made some really moist pumpkin bread (moist because of the pumpkin) that is quite easy to make. They don't call it "quick bread" for nothing! Preheat the oven to 350 degrees. Coat two 8 1/2-by-4 1/2-inch loaf pans with butter; set aside. In a large bowl, whisk together the flour, baking powder, baking soda, cinnamon, nutmeg, allspice and salt; set mixture aside. In the bowl of an electric mixer fitted with the paddle attachment, combine the pumpkin purée and both sugars; mix on medium speed until well combines, 2 to 3 minutes. Add the eggs and oil; mix until incorporated, about 2 minutes, scraping down the sides of the bowl. With mixer on low, add the flour mixture in two batches, alternating with the buttermilk and beginning and ending with the flour, until just combined. Divide the batter between the prepared pans; smooth the tops with an offset spatula. Place the pans on a baking sheet. Bake, rotating the sheet halfway through, until a cake tester inserted in the centers comes out clean, 55 to 60 minutes. Transfer pans to a wire rack to cool 10 minutes. Remove loaves from pans and cool completely. Bread can be kept at room temperature, wrapped in plastic, for up to 4 days.